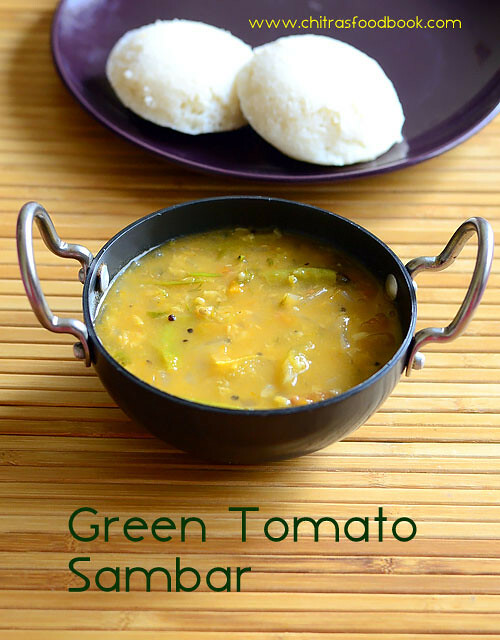 Green tomato sambar for idli – We call it as Thakkali kai gotsu in Tamil. I started buying green tomato ( Raw tomato / thakkali kai / Pacha thakkali in Malayalam ) recently as I wanted to learn some yummy South Indian recipes with it. 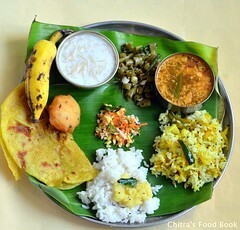 I have heard people make green tomato kootu, curry, thogayal for rice and chutney for idli, dosa. My MIL suggested to try this easy thakkali kai gotsu as the first step. 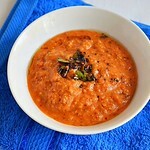 Usually we make Thanjavur style tomato onion gosthu for idli but my MIL told her mom make gotsu only using raw tomato. But my MIL started making with ripe tomatoes. So I too followed the same. 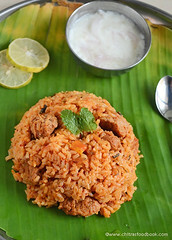 When she suggested this, I was very happy and tried it because thakkali gotsu is our family favorite side dish for idli. So this recipe would never fail. 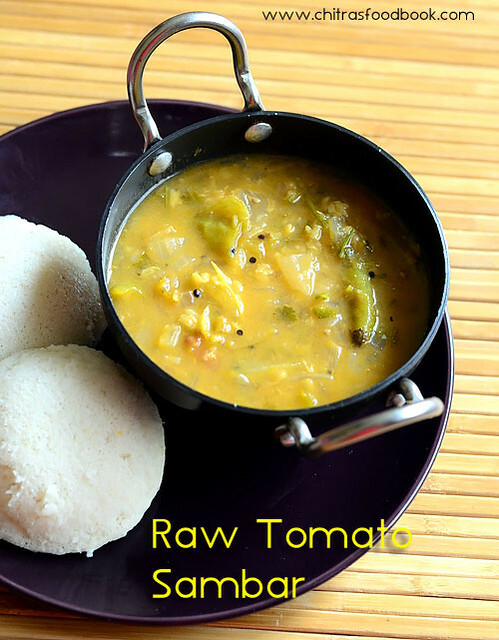 Its a very easy, one pot sambar recipe for idli / dosa. Even though moong dal is added, we make it watery in consistency so that it tastes juicy with idli.Both adults & kids would love this recipe. This thakkali kai gotsu is completely different from Chidambaram gosthu. You must try it know the difference . 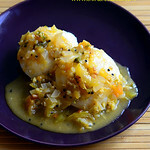 Ok, lets see how to make green tomato sambar / Thakkali kai gotsu for idli with step by step pictures ! 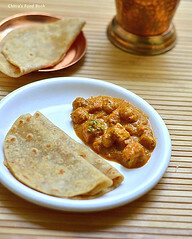 Do check out my ripe tomato onion gotsu, Chidambaram brinjal gosthu recipes. Wash and chop tomato into small pieces. Heat oil in a cooker base. Temper mustard,urad dal,curry leaves.Saute the onion,green chilli adding salt. When onion becomes transparent, add tomato and saute till mushy. Add turmeric powder, moong dal and water. Pressure cook in low flame for 2 whistles.Remove & add idli batter. Boil for 2 minutes. 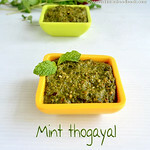 Garnish & serve with Idli. Wash and chop tomato into small pieces.Finely chop onion and slit green chillies, curry leaves and set aside. Heat oil in a cooker base.Splutter mustard seeds, urad dal, cumin seeds and curry leaves. Saute finely chopped onion, slit chilli.Saute till onion becomes transparent. Add tomato pieces, saute till mushy.Add turmeric powder, tamarind extract and 2 cups of water. Add moong dal and Pressure cook in low flame for 2 whistles. Remove after the steam is released. Add more water if the sambar is thick. 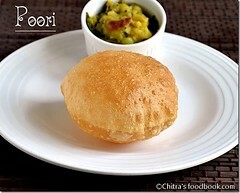 Add idli batter, boil the gravy for 2 minutes and garnish with coriander leaves. Serve with idli drizzled with sesame oil. Adjust the quantity of chilli as per taste. Do not skip tamarind extract. It helps to balance the taste. No need to use jaggery. As we are cooking directly in a pressure cooker, moong dal cooks perfectly. If the sambar is too thick, add more water and boil. 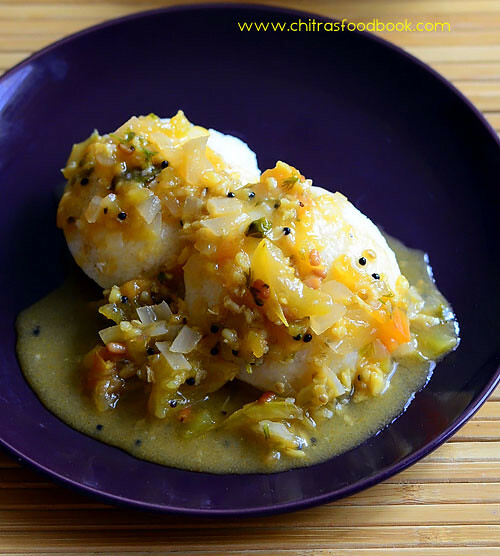 Hot idli topped with gotsu, drizzled with a tsp of sesame oil is divine ! Do try this combo ! why do u add idli batter on top of cooked dal sambar mix. 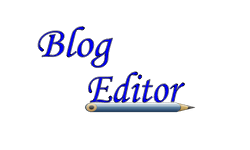 why not besan flour or rice flour? 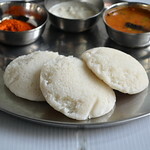 Idli batter adds a mild sour taste and also helps to bind the sambar. 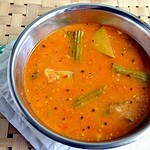 Besan flour changes the taste of this sambar. 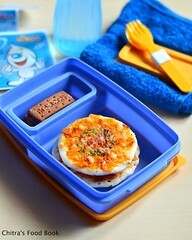 You can add rice flour if you wish.